Gold climbed for the second straight day on Wednesday and hit a two-month high as it briefly went over $941 an ounce. The yellow metal was again helped by a weakened U.S. dollar and rising crude-oil prices. Silver and platinum gained as well. In U.S. stocks, the major indexes fell. Silver for July delivery gained 15.5 cents, or 1.1 percent, to $14.28 an ounce. Gold for June rose $10.70, or 1.2 percent, to $937.40 an ounce — the highest level for the yellow metal since March 26. July platinum climbed 40 cents, or 0.03 percent, to $1,145.50 an ounce. "The main gold price driver of the day was the US dollar, which fell an entire point on the index, reaching to near 81.00," wrote Jon Nadler, a senior analyst at Kitco Inc. "A $2 rise in crude oil to six-month highs above $62 per barrel helped matters for gold on the day, as well." 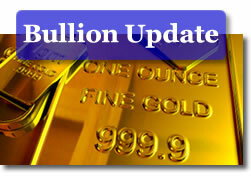 In spot bullion, the benchmark London gold fix price gained $14.75 to $939.50 an ounce. Silver rose 41 cents to $14.29 an ounce. Platinum was fixed $8.00 higher to $1,144.00. In futher news for gold, the World Gold Council said (see PDF release) gold purchases surged 38 percent in the first quarter of 2009. Demand jumped to 1,015.5 metric tons compared to 733.9 tons a year ago. The Energy Information Administration reported Wednesday that crude inventories declined more than expected last week, although demand was still weaker than a year ago. New York crude-oil for July delivery soared $1.94, or 3.2 percent, to $62.04 a barrel. There has been no respite for gasoline costs at the pump. The average price for unleaded gasoline jumped 2 cents to $2.334 a gallon, according to AAA. The price is 6.7 cents higher than a week ago and 28 cents higher than last month. In a late stage sell off, U.S. stocks declined after the "Federal Reserve reduced its growth targets and raised unemployment expectations," according to CNNMoney. The Dow Jones industrial average fell 52.57 points, or 0.62 percent, to 8,422.28. The S&P 500 Index dropped 4.64 points, or 0.51 percent, to 903.49. The Nasdaq Composite Index declined 6.70 points, or 0.39 percent, to 1,727.84.